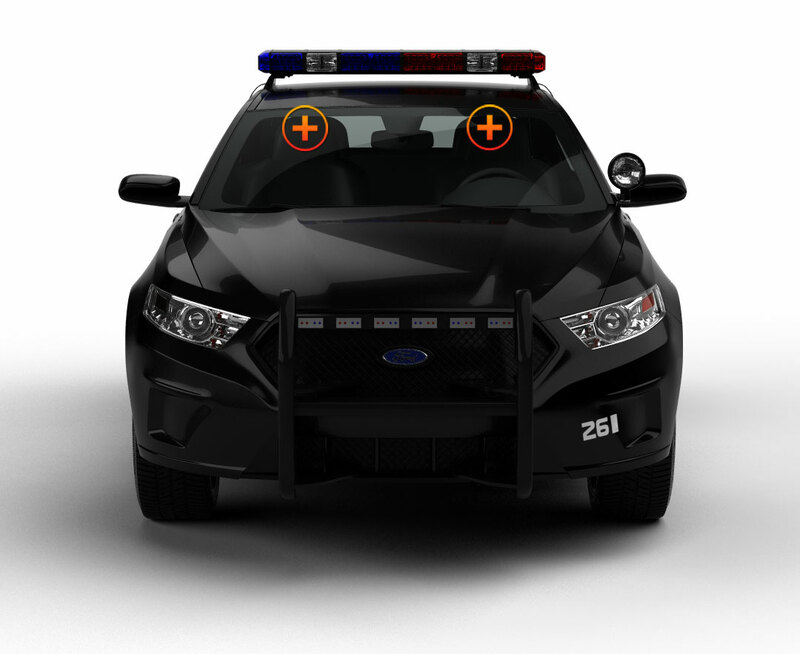 The LED Stealth Commander is ETD’s brightest and most powerful of our visor mounted led emergency vehicle lights and our #1 BEST Seller. It certainly Commands full attention in any critical emergency or civil situation with its 90 Watts of flashing, colorful light. The digital controller on the back of the bar on the driver’s side makes directing traffic a smooth, efficient operation. With a push of a button, 90 luminous Generation III 1-Watt bulbs perform the light-pattern maneuvers that you designate, and each of the 26 flash patterns is shown on the back of the control display. The layout of the digital controller makes it quick and easy to turn the Commander into a fully directional traffic advisor. The Commander is housed in durable polycarbonate units with linear lenses that spread the lights even wider and farther than a normal TIR lense. 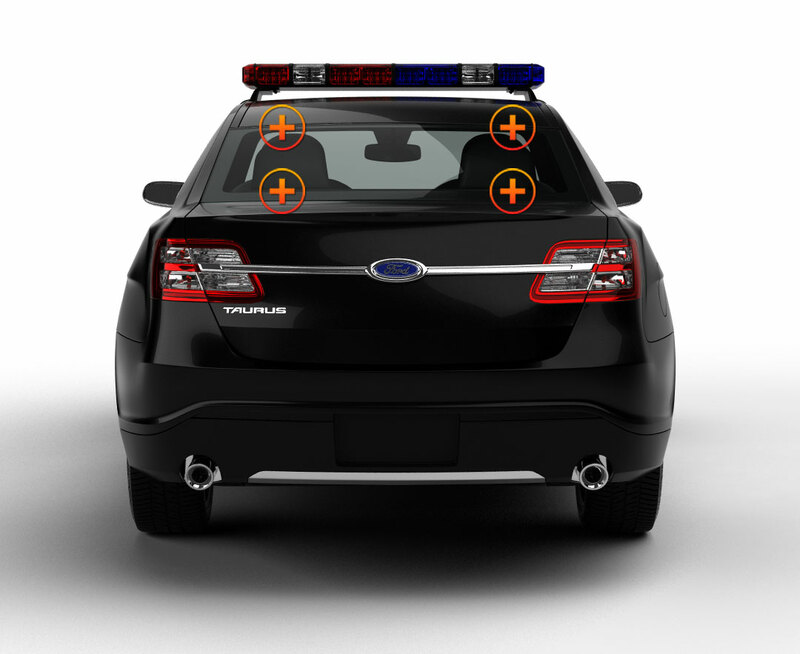 Optional takedown lights give you even more light at $20/pair and are placed at the innermost position in the center of your police or POV vehicle. The power cord plugs into the lighter socket. The Stealth Commander is a powerhouse of light that ensures steadfast dependability when you want to come out of hiding and flood an area with light. Just got these lights today, and installed them tonight. These lights, are ridiculously bright. You definitely won't go unnoticed! This is a great light. First let me say that this light is VERY bright. I have no problem getting driver's attention with this unit day or night!. Flash patterns are different enough for most people to find one that they like. Install instructions were found on the website, it's not overly difficult to install. Over all I would say this is a very good light, well worth the money. The light is bright and the control panel on the back of the light makes it easy to use. This light is awesome. It has completely changed the look of my truck. I will do more business in the future with you guys. Shipping was extremely fast. The led stealth commander visor light is an amazing light bar. Easy to install and very bright behind window tint. My 2005 silverado has a 2.5% tint eye brow and you can see it very easy during the day. It is also very bright at night. Shipping was fast. The flash patterns are awesome and this is definitely worth the money. The light is awesome! The cable between them could be a little longer for sure. 5* for the light! I couldn't be more happy with this light. i installed it on my bmw, it was a tight squeeze with my rear view mirror. But the light is great and love everything about it. By far the best investment ive made with my vehicle lighting. you cant go wrong! I wanted to go with a slick top set up because I really didn't want a light bar on my truck. My friend got a light like it and I chose to go with it as well. I am very happy with it. Eye catching in the daytime and if you can't see me coming at night then you must be blind. Great light and great prices. Overall great light. I installed it in my Tundra and love it. Only problem I had, the cable connecting the two lights is only 12" long, where I needed about 15" for the spacing of my visors, no biggie, just modified the brackets a bit. Overall, as I mentioned before extremely satisfied. Can't beat the price. Best interior lightbar I have ever seen. I was deciding between getting a full light bar or just getting these. The Stealth Commander is awesome for what it does. Very easy to install (although it lacks installation directions), very nice controls (toggle on lighter plug) also love how it has the control parameters to toggle takedowns on standalone or with the flash code. Buttons also have an audible beeping sound when pressed. Light bar fits perfect in my Crown Vic and looks badass. Brightness is a 9.0 out of 10 (10 being a Whelen Liberty). Although the 26 patterns could be of better variety, it does have a good selection of strobe, wig-wag and warning patterns. The directional patterns are cool as well, I just do not have use for them. Takedowns are exceptionally bright and are definitely worth the extra $20, takedowns are very eye-catching when they are flashing with the rest of the lights. The included surface mounts are a great bonus, I have not installed them yet, but I expect them to be decent (seem of good quality). Shipping time is awesome and customer service is very fast. Overall, this lightbar in my opinion is worth about 2x more than it is priced for on ETD. Great company and even greater light bar. Trust the 13 other people who all rated this 5 stars. Buy this light bar!! I love this light. I got this light for my Chevy Colorado and it was easy to install. I was looking for a light that was very visible in the daylight and this light is amazingly bright. The only thing I can say bad about it is, in my Chevy Colorado the light hangs a little lower than i would prefer but I cant help but give it 5 stars. GREAT LIGHT!!! Beyond satisfied. I bought this for a promotional vehicle, very bright during the day BLINDING at night. Extremely easy to install especially in an odd vehicle like my 2011 Volkswagen GTI. These lights are awesome!! I'm a volunteer firefigter/EMT and I got these lights in blue with white take downs. They are very bright and visible even in the day! They do a great job at moving traffic! I get compliments on them all the time! I installed my Stealth Commander lights in my POV in October, 2011. I had to make some modifications to the mounting brackets to accommodate installation into my 2011 Avalanche. As a result, I have to rate the ease of installation a bit lower than I was expecting. However, the lights have worked terrifically. They are very bright, have a number of useful flash patterns, and the directional feature is very useful. Traffic pulls over well in advance, day or night. I am impressed with the quality of the lights, and I am very impressed with ETD's prices. I have no trouble recommending ETD around my department. Great visor light, very bright, great patterns, and easy to install. Overall, great light and would recommend to anyone. I will continue to purchase my lights from ETD. just got this light today . nice quick and easy install . it is deff, worth the money this light is super bright and everyone moves out your way . Bought this light about a year ago.....very bright and moves traffic well in advance.. mounting in my F-150 was a snap....Great Light! highly recommended....good job guys! This is the pride and joy of my work vehicle. When I turn this baby on, traffic MOVES! Way to go E.T.D.!!! Bought these about 6 months ago and love them! They are extremely bright and are very concealable. I have no complaints and would recommend this to anyone. I installed on a 2007 Dodge Ram and it looks great! This light is awsome. I purchased it for my husband as a gift and he loves it. It is very bright and can been seen from a distance. We will recommend this light and Extreme Tactical Dynamics to all of our friends. I will also be shopping with this company again. Now THIS is a light!! I have this mounted in the rear deck, it looks like just one long light, but who cares!! The size doesn't obstruct my view even in a crown vic, and yet it puts out the lights lemme tell ya! people coming up behind me can see a mile away and move. I will surely get more lights here again!